(2014). Nanoparticles of Cyclodextrins & Their Applications in Food Technology. International Journal of Bio-Inorganic Hybrid Nanomaterials, 3(1), 5-10.
. "Nanoparticles of Cyclodextrins & Their Applications in Food Technology". International Journal of Bio-Inorganic Hybrid Nanomaterials, 3, 1, 2014, 5-10. (2014). 'Nanoparticles of Cyclodextrins & Their Applications in Food Technology', International Journal of Bio-Inorganic Hybrid Nanomaterials, 3(1), pp. 5-10. Nanoparticles of Cyclodextrins & Their Applications in Food Technology. 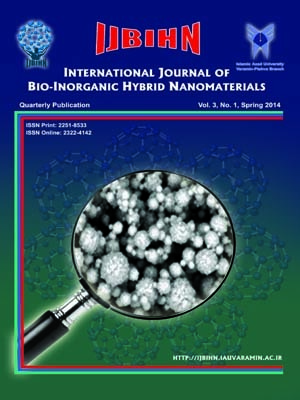 International Journal of Bio-Inorganic Hybrid Nanomaterials, 2014; 3(1): 5-10. Cyclodextrins (CDs) are a family of cyclic oligosaccharides which are composed of α (1,4) -linked glucopyranose subunits. Thebest-characterized forms are α, β and γ CD which are consisted of six, seven and eight D-glucose units, respectively. Cyclodextrins are produced from starch by enzymatic degradation. These macrocyclic carbohydrates with polar internal cavities can form complexes with and solubilize many normally water-insoluble compounds. Cyclodextrins are useful molecular chelating agents. They are used in food industry as food additives, for stabilization of flavors, for elimination of undesired tastes or other undesired compounds such as cholesterol and avoiding microbiological contaminations and browning reactions. Also, the molecular encapsulation of lipophilic food ingredients with cyclodextrin improves the stability of flavors, vitamins, colorants and unsaturated fats, etc., both in physical and chemical sense leading to extended product shelf-life.